Traulevium™ Veterinary Gel is sold exclusively through Veterinarians and registered with the FDA as a product for animal use only. Traulevium™ Veterinary Gel is manufactured exclusively for MTP™ by a manufacturer known to produce high quality homeopathic remedies. The FDA registered manufacturing site located in the countryside of Texas. The dilutions are guaranteed to be reliable. The large bottle with a smooth dispensing pump is the ideal product size and delivery format for the veterinary market. We know you’ve had a lot of whiplash over the past 3 years with changes in the homeopathic industry in the United States. Traulevium™ Veterinary Gel restores the order. 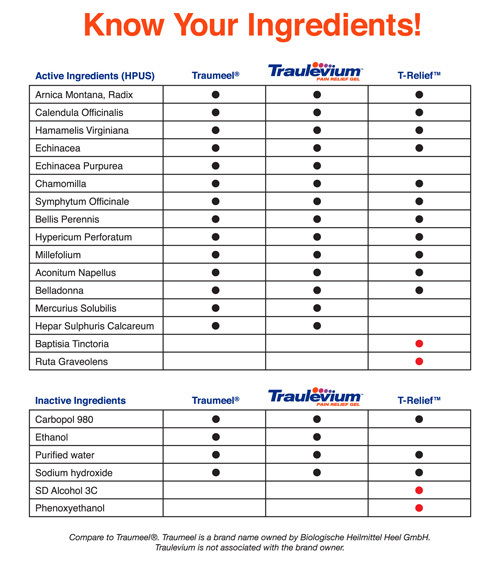 Please try Traulevium™ Veterinary Gel yourself to find out! Apply generously to affected areas 2 to 3 times daily, or more often if necessary. Massage thoroughly into the skin. If appropriate, mild compression or occlusive bandaging may be applied. **T-Relief® is a brand name owned by MediNatura Inc. Traulevium is not associated with the brand owner.